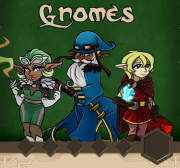 A race within URealms Live is the species of a character that determines to some extent their appearance and personality. Races have not always existed in their current form. 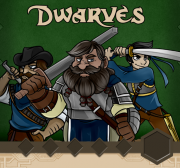 Band of Thieves introduced the first race cards, for Dwarves and Gnomes. 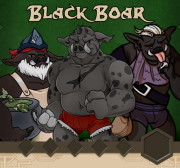 Since then some new playable races have appeared. These are races that have been available at character creation to play as in an official campaign. 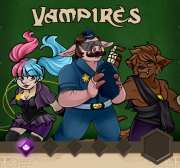 A player's race provides a specified amount of base stamina, as well as a unique ability. These are special characteristics that can be applied to any race that alters their physical appearance, or some of their backstory. 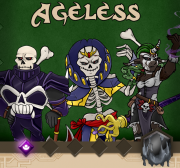 The Ageless are a group of Skeletal creatures mainly created through Dark Magic rituals. Being an Ageless makes one nearly immortal, with their only weakness being their skull. 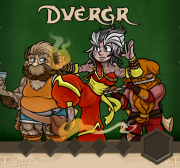 Dvergr cannot become Ageless, as their skeletons are made of stone. 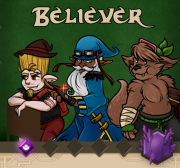 Believers are a group of Arcane beings who possess books and become characters from those books, and attempt to fulfill the character's story as best as they can. Vampires are people who are in constant search for their soul mate and can see through the lies of others. 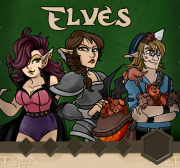 These are races that only NPCs have existed as. Some creature races may be made into playable races in the future. Beenu The Beenu are an ancient race of technologically advanced, feathered people, who were culled to extinction under Lyn Azveltara's orders. Some of their remains can be found in the Zarlin Catacombs, and other Great Halls. First seen in Azveltara Z.
Dornabor A shapeshifting creature that takes on the shape of the thoughts of those surrounding it. First seen in The Tower of Ultimate Wizardry: Chapter One. Dragon Dragons are creatures of amazing power. Currently the only known dragons are the Dragon Aspects, their children, and the Sun and Moon dragons. Fairy Small creatures that have healing abilities, and can give advice to their master. Frog Frogs can be put on a stick and put into the ground to allow allies to regain stamina. Glamourshark Glamoursharks are glamorous shark-like creatures that live in The Drink. They seem to like Fish Yogurt. First seen in The Jewel of the Dingo Isles. Golem Golems are creatures made out of any material to fulfill a specific goal. First seen in Fall of Dundinborough. Hobgoblin Hobgoblins are normally larger than regular Goblins, but are hated by them and viewed even lower than them by Elves. Humming Bird A Humming Bird was killed by Heathera Stonemason's magic while showing off. First seen in Woodcarvers. Ladybug A Ladybug was enlarged while SK Malone's Mercenaries fought Sun and Moon wolves. First seen in The Blood Snake Queen. Leech Leeches are small, harming creatures, that are often trapped in jars to be used as a weapon. By sucking blood they can weaken creatures permanently. Mermaid Mermaids are aquatic humanoids with the tails of fish that naturally feed off of the life force of others to survive. The drawing of this life force converts their victim into an Ageless, which was how the first Ageless were formed. First seen in The Senate of Deadlantis. Nimbus Nimbi are sentient clouds that can be summoned by Monks to defend themselves. They are created through using powerful Earth Magic, and are usually deceased family members, or close friends. 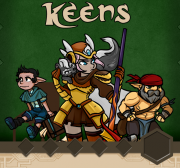 First seen in Kobold Headhunters. Parrot Parrots seem to be able to not only mimic speech, but create their own sentences. They can also apparently live inside another creature's mouth for extended periods of time, but they do not like it. First seen in The New Crew. Rat Rats are small rodents. Scrooge Scrooges are Ducks that steal treasure and can shoot a ray of frost out of their bill. 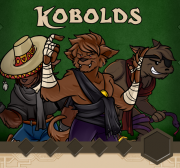 First seen in Kobold Headhunters. Stone Guardian Stone Guardians are enormous stone statues that protect the temple of the Dingo Isles. First seen in The Jewel of the Dingo Isles. Swammie A magic fish that has oils which cause hallucinations. Rancid Swammies make the magic abilities of those who consume them unstable. Wolf Wolves are fierce beasts, but are loyal to their owners. These are races that have only been discussed or mentioned in campaigns or on cards, but have not yet appeared in a canon campaign. Beetle Beetles are collected in bags, a delicacy of Gnomes. 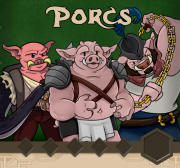 Forn The Forn are mentioned as a race created by Thor. Other than this, there is no canon information known about them. First mentioned in Okagnoma Guild Hall. Mammothboar A Mammothboar was mentioned by Noxel's Squire, and this Mammothboar was supposedly fought by Noxel and it was showcased in Berserker Monthly. 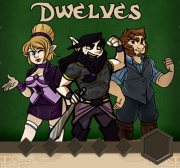 First mentioned in Kobold Headhunters. Medusa A Medusa has the ability to control the minds of others with their gaze, and has snakes for hair. First seen in The Many Gobos of Pat. Scorpion Scorpions were mentioned by Patrick Cake, who cautioned his team to watch out for Scorpions in the desert. First mentioned in Guild of Explorers. Shellmind Creatures that live deep underwater and produce an item called the Water Candle. Mentioned as a race created by Thor. This page was last modified on 28 March 2019, at 14:26.